BabyLegs warmers are an essential staple in a modern child’s wardrobe. Cute, stylish and functional – they make diaper changing a breeze, keep tiny knees comfortable while crawling and protect small legs and arms from the cold. Try pairing with a t-shirt for a fun, layered look. 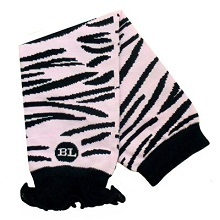 The Zazzy Zebra leg and arm warmers are sweet and sassy with a light pink zoo animal print and a girlish black ruffle. Bring a smile to the faces of kids and parents alike with these adorable warmers as a birthday or shower gift. Machine washable. Made from a blend of cotton, nylon, spandex and polyester. FREE SHIPPING ON 2 OR MORE BABYLEGS!